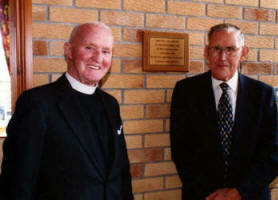 Pictured at the opening and dedication of Ballymacbrennan School Hall on 30th October 2000 are the Rev. John McCaughan - Legacurry Senior Minister and Mr John Mackin. 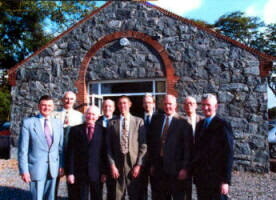 Trustees of Ballymacbrennan School Hall. L to R: David Adams, Wesley Cairns, David Jamieson, Norman Moore, John Martin, Desmond , Tom Graham, James McAreevey and William Baird. The beautifully renovated Ballymacbrennan Old School, now a private dwelling. Ballymacbrennan leaders. L to R: Norman Moore, David Adams, John Martin and Desmond Shortt. 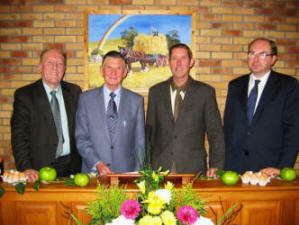 In the background is a painting by the late Jack Calderwood, showing a harvest scene. 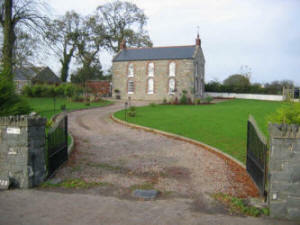 The Ballymacbrennan School was built in 1834 and for some 90 years it catered for the children of the surrounding area. The teacher in the 1920’s was a Mr. Deans who lived in the adjoining house. When his own family had finished their education, he applied to the authorities to have the school closed and himself named as a beneficiary. This did not go down well with the local farmers who decided to take Mr. Deans to court. The Rev. Joseph Cordner of Drumbo House and Dr. Hemphill, Rector of Drumbeg Parish, headed the appeal. A ruling was made that under the ownership of the Marquis of Downshire a committee of 10 to 12 men of the countryside should be responsible for the school. It was to be used as a community centre for people of the district and the adjoining house was to be let to a tenant. Mr. Deans was asked to leave. The Rev. Cordner, Dr. Hemphill and the minister of the Covenanter Church at Bailiesmills, then held weekly meetings in the school for a period of time. In the following years and throughout the 1950’s, various social activities took place at the school. It was used for wedding receptions and public meetings, including those of the Unionist Party. At times of elections it was used a Polling Station. The Old School is associated mainly as a place for religious meetings. An afternoon Sunday School was held there for several decades. At its height, seven classes met regularly every week, with the building full to capacity. Mr. James Shortt, from the Ballymacbrennan area, and Mr. James Martin from the Saintfield Road, both served as superintendents. The Sunday School finished around 1980. (Mr James Shortt’s grandson - Desmond Shortt and Mr James Martin’s son - John Martin are shown in the above photo of the trustees of the property). In November 1952 the Faith Mission organisation approached the Property Committee with the request to use the building for Gospel Meetings. This was gladly granted. The building also became the meeting place for annual conferences of the Mission. The Old School became a Listed Building in 1987. In 1999 work commenced on the erection of the new Ballymacbrennan School Hall. In the same year, the two-storey old school, which included a teacher’s residence at the rear, was fully renovated. The building was sandblasted, and a new roof and conservatory added. It was sold in 2001 and the money used to finance the building of the new hall and large car park facility. The Rev. 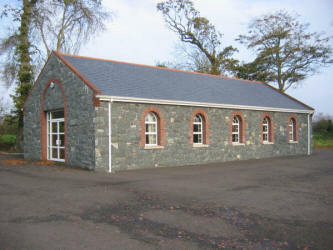 John McCaughan, Senior Minister of Legacurry Presbyterian Church opened the new Ballymacbrennan School Hall was opened for worship on Saturday 30th September 2000.